Delta has announced that they will fly to India (BOM) from either ATL or JFK in 2019. My opinion is that they fly from ATL to BOM. They just don't have enough connecting traffic at JFK so have to rely entirely on O & D. However with the price of oil going up this is not final and they may shelve the plans. If United is successful on the EWR BOM sectory and Air India too, i think Delya Airlines will also do well with JFK BOM sector and not ATL BOM. As usual, DL's bogus argument about the Gulf carriers has no merit. 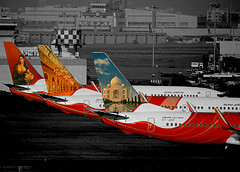 It's not as if the big Gulf carriers are cutting frequencies to India. They're just halting further 5th freedom operations through Europe to North America. This is PR theater at its most transparent. In reality, it's just that the US-India market is now more premium friendly (DL's prior premium product was junk and couldn't compete with what other carriers offered), DL has more efficient aircraft that can fly nonstop to India, the Gulf carriers are capacity constrained by bilaterals into India, and the Jet partnership and the existence of T2 in BOM allows for better connectivity on the India side.